The Bukit Tigapuluh Landscape Conservation Programme has grown from an orangutan reintroduction project into a large scale conservation programme that includes Sumatran elephant conservation, community development, education and forest protection. The Bukit Tigapuluh landscape is a biodiversity hotspot and our goal is to preserve its beauty, its wildlife and its importance as a functional ecosystem for future generations. 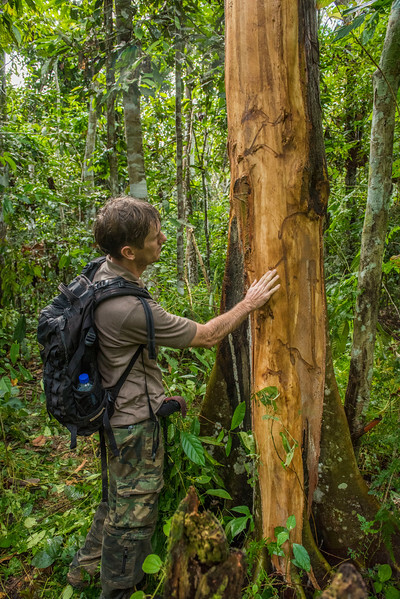 Alexander Mossbrucker discovering fresh evidence of the elephants’ presence, bark has been ripped off the tree and impression marks from the tusks are clearly visible.